A month of snow has hugely increased the demand for 4x4s when all most people really need is a set of winter tyres. British Car Auctions reported massive increases in prices realised for used 4x4s in the general knee-jerk reaction to the snow and the threat of colder winters in years to come. The waiting list for Audi Q5s stretches 6 months into the New Year. Now Toyota reports sales of both Land Cruiser and Land Cruiser V8 up 77 per cent and 120 per cent respectively over the same period from last year. Celebrating its 60th anniversary in 2011 the Land Cruiser is one of Toyota’s most iconic vehicles with a legendary reputation for toughness and reliability and a proven track record to perform in the most severe environments from deserts and jungles to arctic wastes. With more than six million units sold since launch, Land Cruiser is available in more than 140 territories and manufactured in nine plants in five countries. 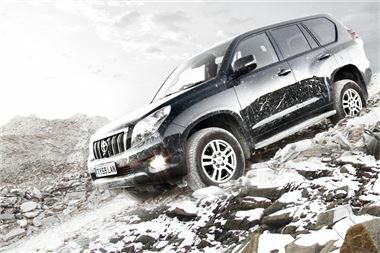 In the UK, Land Cruiser is available in three grades, using a 3.0-litre D-4D diesel engine, 5-speed automatic transmission and provides user-friendly advanced technologies for handling, safety and driver guidance. This includes Multi-Terrain Select system, Crawl Control and Multi-Terrain Monitors. Its larger stable mate, the Land Cruiser V8, uses Toyota’s most powerful diesel engine, a 4.5-litre D-4D providing 282bhp and 650Nm of torque, through a six-speed automatic transmission with sequential manual gear change. Available in one luxury specification, features also include multi terrain ABS optimising brake control to suit driving conditions, the world’s first 4-wheel Active height Control and Adaptive Variable Suspension. Both vehicles have the ability to seat seven and are covered by a comprehensive manufacturer 5 year, 100,000 mile warranty. Just remember that in snow, winter compound tyres on a two wheel drive vehicle are generally more effective than summer compound tyres on a 4WD, allowing better year round economy. Though, of course, nothing is as effective as winter compound tyres on a 4WD.